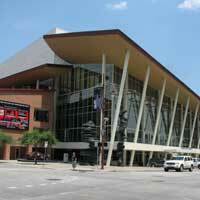 The Hobby Center for the Performing Arts is a theater in Houston, Texas, US. Opened to the public in 2002, the theater is located downtown on the edge of the Houston Theater District. Hobby Center features 60-foot-high glass walls with views of Houston's skyscrapers, Tranquility Park and Houston City Hall. The Hobby Center is named for former Texas lieutenant governor and Houston businessman, William P. Hobby, Jr., whose family foundation donated the naming gift for the center. The center replaced the former Houston Music Hall and Sam Houston Coliseum.